JAKARTA - Sinar Mas Land, one of the leading property developers in Southeast Asia through PT Bumi Serpong Damai along with a consortium of Japanese companies led by Mitsubishi Corporation today inaugurated the opening of The Zora Marketing Suite. In realizing this partnership, Sinar Mas Land through PT Bumi Serpong Damai and Mitsubishi Corporation has established a joint venture company in Indonesia named PT BSD Diamond Development. The Zora area stands on a land area of 19 hectares and in the future will be built as many as 1,000 units of home sites and commercial areas. Carrying the concept of "Beauty of Balance", The Zora has a meaning of "sky" in Japanese. This area is designed with observing to a green environment and modern life to provide maximum comfort and value life balance. Ishak Chandra, CEO of Strategic Development and Services Sinar Mas Land in a press release today revealed, "Sinar Mas Land together with Mitsubishi Corporation presents premium residential products and quality in responding to the needs of today's society. 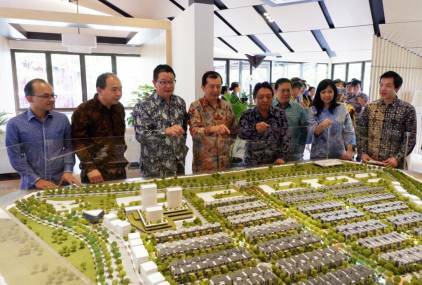 This prestigious collaboration project proves that the high confidence of foreign investors to develop BSD City area, with an investment of more than USD 260 million. The Keia Cluster is the first residential project of The Zora in BSD City. Standing on 4,5 hectares of land, this cluster is designed to blend green environment elements and modern life and apply smart living facilities. Each building is equipped with an energy conservation system, Low-E glass & solar water heater, up to other eco-friendly features. "High-quality building, the best facilities and a variety of access options make Keia Cluster as a proper dwelling for people who want to have a home in BSD City or invest. We hope this dwelling can answer the needs of the community," conclude Ishak Chandra. JAKARTA - Ministry of Public Works and Housing (PUPR) has completed 10 towers of Athletes Flat Kemayoran. JAKARTA - The leading Property Developers in Indonesia, PT Bumi Serpong Damai Tbk. SURABAYA - The first apartment of Sinar Mas Land in Surabaya, Klaska Residence, has been officially built.